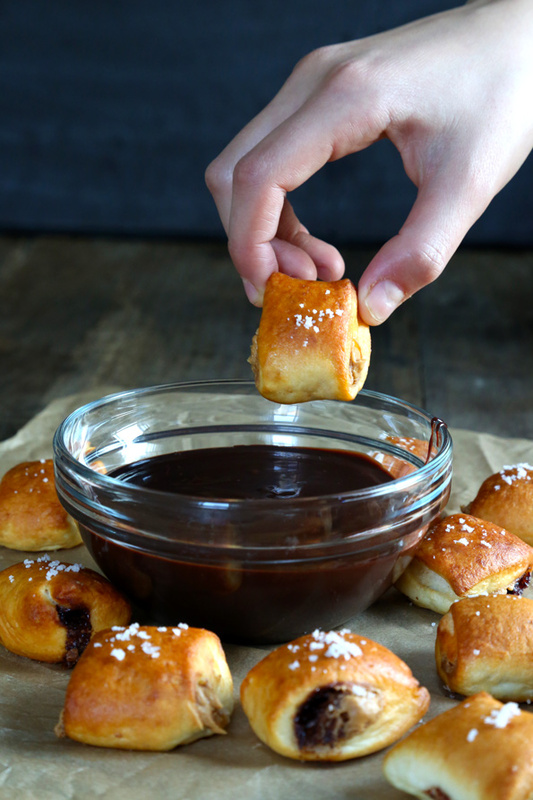 Stuffed Gluten Free Soft Pretzel Bites | Great gluten free recipes for every occasion. You know how sometimes you slave over a hot stove and oven for hours, and your family just kind of, well, shrugs when you place your masterpiece in front of them? Well sometimes I’m just simply not willing to risk such a lukewarm reception so I need a homerun. That’s when I break out recipes like Garlic Pizza Bread Sticks—and/or these stuffed gluten free soft pretzel bites. They’re sweet and salty, chewy and just a little bit crisp. In other words, they’re perfect. I filled some with Nutella, others with peanut butter, and still others with a mix of the two. I’ll be honest: I preferred the bites stuffed with just peanut butter. But wait! I have good reason. Nutella hazelnut spread (yes! it’s gluten free) is unlike any other nut butter, as it’s quite a bit thinner. As such, it really does tend to run. And since I tried filling these bites every which way and found that the best way is by filling a whole cylinder at once, and then slicing the cylinder into bites, there will be some filling that peeks out the side of each bite. And when that filling is Nutella, it is more likely to escape from the sides of each bite during baking. The other potential way to fill the bites is to pipe tiny little mounds of filling onto a baking sheet like this, freeze them, and then wrap a small piece of dough around each mound. But then you end up with round pieces of dough, and personally I just don’t like the look. Pretzel bites should have squared edges. 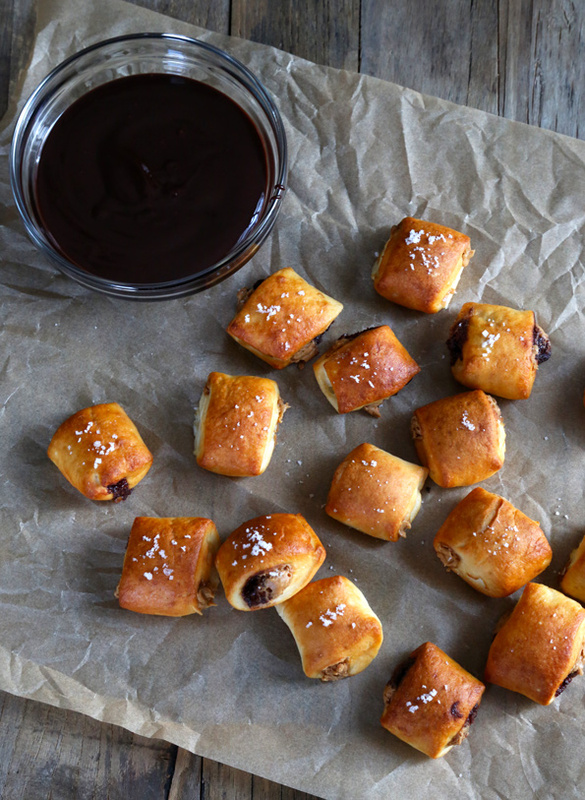 They rise better, and bake up more beautiful—just like you expect pretzel bites to look. 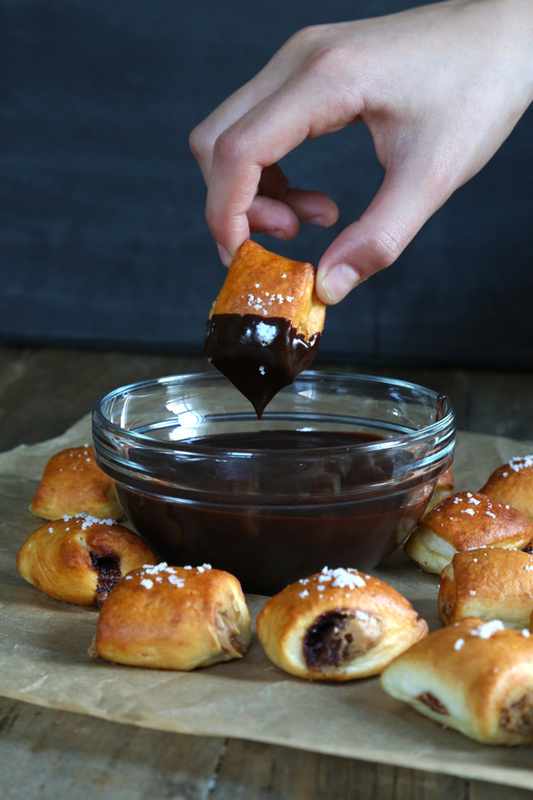 Serve them with hot fudge sauce, or just melt some chocolate for dipping. They’re a sure thing. And sometimes, that’s just what you need. Wouldn’t these be perfect for Black Friday? Family baking project day! *NOTE about salt used for sprinkling: If you don’t plan to serve all of the pretzels immediately after baking, consider baking without a sprinkling of coarse salt on top of the dough entirely, or with a very light sprinkling of it. Salt on the top of bread draws moisture out of the bread and causes it to go stale more quickly. If you do eliminate the salt (or most of it) during baking, simply brush the pretzels with more melted butter and sprinkle with coarse salt before serving. *If you prefer, instead of allowing the dough to rise slowly in the refrigerator as directed in the instructions, you may make and use this dough on the same day. After making the dough, set the covered dough to rise in a warm, draft-free environment to allow it to rise to double its size (about 1 hour). Once it has doubled, place it in the refrigerator for at least 15 minutes or until it is chilled. This will make it much easier to handle. Then, continue with the rest of the recipe instructions. Prepare the filling(s). Place the peanut butter or Nutella in a pastry bag fitted with a small, plain piping tip (with an opening 1/4-inch in diameter). 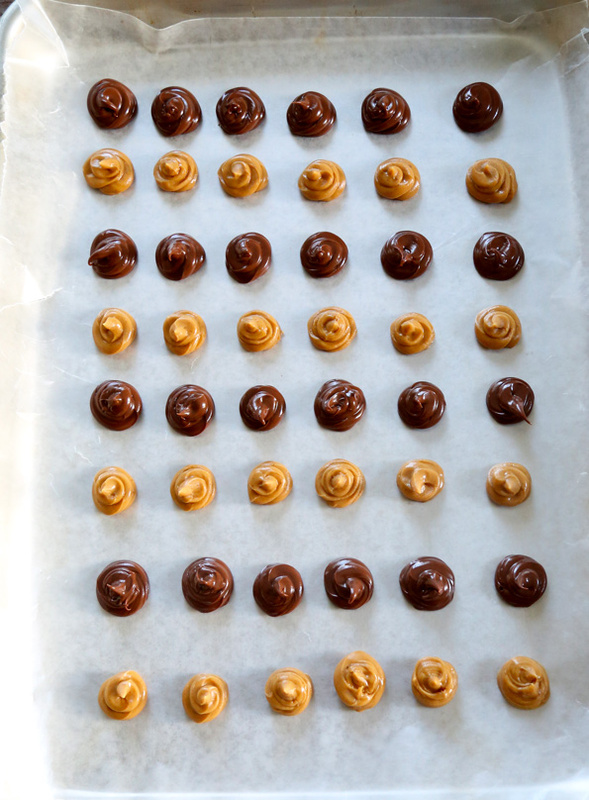 If using both peanut butter and Nutella, place each in a separate piping bag, and use half as much of each spread. Set the bags aside. Shape and fill the dough. If using the pretzel dough from page 153 of GFOAS Bakes Bread, on a lightly floured surface, knead the dough until smoother as directed in These General Shaping Tips. Divide the dough in half, and roll each half into a ball as illustrated in this gluten free bread shaping video. Divide each ball of dough into 4 equal pieces. Work with one piece of dough at a time, and cover the rest loosely with a towel to prevent them from drying out. Pat each piece of dough into a rectangle about 9 inches long, sprinkling lightly with flour as necessary to prevent sticking. Starting on one short side of the dough, pipe a line of the filling about 1/2-inch wide in the center of the dough from one side to the other. If using both peanut butter and Nutella, pipe a line of each in the same manner, each about 1/4-inch wide. Enclose the filling tightly in the rectangle of dough by folding both long sides of the dough over the filling, and pinch to secure and create a cylinder. Rock the cylinder gently back and forth to seal. Repeat with the 3 other pieces of dough. Using a floured bench scraper or sharp knife, slice each of the 4 ropes into 1 1/2-inch bite-sized pieces of dough. The filling will be peeking out the sides of each bite a bit. Place the bite-sized pieces of dough on the prepared baking sheet, about 1 inch apart from one another. Dust all of the shaped pieces of dough lightly with flour, then cover with lightly oiled plastic wrap. Set in a warm, draft-free location to rise until nearly doubled in size (about 40 minutes). Boil and bake the pretzel bites. As the dough nears the end of its rise, preheat your oven to 350°F. In a large pot, make the baking soda bath by dissolving the baking soda and salt in approximately 6 cups of water, and bringing it to a rolling boil over medium-high heat. Once the dough has finished rising, place the risen bites a few at a time in the boiling baking soda bath for about 30 seconds per side. 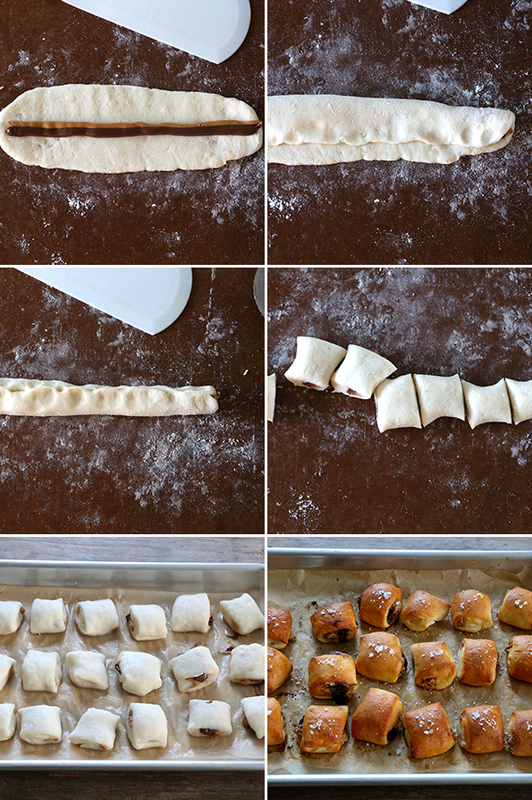 Remove the boiled dough with a strainer and return the pieces to the baking sheet. Place the baking sheet in the center of the preheated oven, and bake until golden brown all over (about 12 minutes). Remove from the oven and allow to cool on the pan briefly before serving with the Hot Fudge Sauce for dipping. Adapted from Two Peas and Their Pod, as selected by you from my Must Make Gluten Free Pinterest Board. P.S. If you haven’t gotten your copy of Gluten Free on a Shoestring Bakes Bread, won’t you grab one today? Your support means everything to me! 2) Your recipes are THE BEST. Both of my girls (9 & 5) request “Gluten Free on a Shoestring” when I’m looking up new recipes. Is it necessary to fill them? I think I’d like them covered with butter & cinnamon sugar, just like Auntie Anne’s! That’s a bit of a different recipe, Melanie. But good news—I’ve got that one, too: <Auntie Anne's-Style Cinnamon Sugar Gluten Free Soft Pretzel Bites. That’s a bit of a different recipe, Melanie. But good news—I’ve got that one, too: Auntie Anne’s-Style Gluten Free Cinnamon Sugar Soft Pretzel Bites. Thanks, Nicole. I forgot about that recipe. Bookmarking it now! Oh, I love the cheese idea. How about it all knowing one . Nicole Hunn…how do I love thee? Let me count the ways! Oh I really need to meet you and just hug you and bow to you!!! I must make these this weekend! Seriously, next time we come back east to see family, I want to buy you a cuppa cawfee (but not Starbucks). hmm how would you do some with cheese..yummy!! If you use a low-moisture mozzarella cheese, it should work just fine, louetta. You could also melt the cheese and pipe it in a line, just as this recipe directs you to do with the peanut butter and/or Nutella, and then proceed with the recipe as directed. That would be my suggestion!